Yesterday’s blog post was all about being shoeless intentionally (Barefoot College), and today is the flipside–trying to get children shod to fight disease and injury and increase the quality of life while also empowering and educating through sport. Shoe4Africa started in 1995, when donors sent shoes to athletes in Kenya. By 1999, the organization was promoting AIDS awareness through sport. While the name says “Africa” they have worked in many nations: Russia, Sri Lanka, Dubai, Morocco, refugee camps, parts of America, etc. 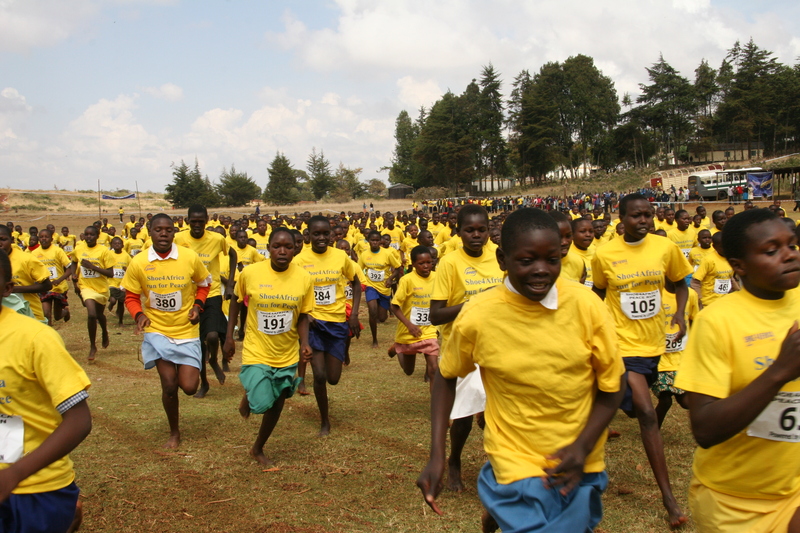 By 2006, they held a race: the largest women-only event in Kenya, then a similar event in Tanzania. By 2008, they had such a continent-wide and Internet savvy presence through their AIDS education work, that they were asked to build an East African children’s hospital–only the second one in all of Sub-Saharan Africa. TV star Anthony Edwards turns his fame from the show “E.R.” into philanthropy for the cause, and many international Olympians have also joined the efforts. Athletic events pepper the annual calendar, including a Deaf and Disabled run, plus malaria campaigns, general health education, and the cause continues to grow, attracting the likes of Natalie Portman, Hugh Jackman, Elijah Wood, Jake Gyllenhaal, Rosario Dawson, Tom Cavanagh, Michael Stipe, Ellen DeGeneres, and more. Food packets now get distributed in addition to shoes, scholarships for youth help them reach previously unattainable levels of education, primary schools have been built and outfitted with textbooks and some laptops, and in the wake of the devastating storm, Sandy, that hit the NY area around the same time a Shoe4Africa 5k race was o be run in Manhattan, they turned their focus, temporarily, to relief for the children affected by the storm. Now the work continues in an ever more facile way, finding holes in the fabric of the systems for African youth, and plugging them. Find out more, get super-inspired, and support Shoe4Africa (send shoes, send donations, donate air miles, etc).